INVISIBLE MAN VS. THE HUMAN FLY (1957) Junko Kanoi. Ryuji Shinagawa, Shozo Southern, Ghastly murders are being committed. The one similarity is that an odd buzzing sound is heard before each murder. The killer is actually a man who shrinks to the size of a fly, then regains full size right before he kills his victims. The shrinking formula is a secret military weapon stolen by a crazed war criminal However, a physicist has invented an invisibility ray and becomes invisible to stop the murdering monster. Great schlock! In Japanese with English subtitles. From 35mm. 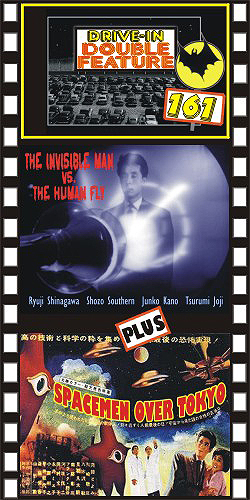 PLUS: SPACEMEN OVER TOKYO (1956) Toyomi Karita, Keizo Kawasaki, Bin Yagisawa, Shozo Nanbu. A spaceship full of starfish aliens visits Earth to warn of impending global destruction. Good special effects highlight this fine sci-fi epic. Definitely one for the collection. Aka Warning from Space. Nice color, 16mm.